Winter is a special time of year where we all come together to fill our bellies, reconnect with friends and family, crunch through the sparkling snow, and share in the Christmas spirit. I love gifting a mix of handmade goods and carefully selected, sustainable products, to spread some Christmas magic, whilst doing your bit for the environment. Here’s a pick of some of my earthly treasures from across the UK and beyond that cater for all budgets. These beautiful products are handpicked by me for their slow-living vibes and ethical nature – and there really is something for everyone. Choose independent sellers this year, as you will be making their Christmas dreams come true! For that someone who loves to manifest with the moon, there hand poured soy candles are magically and spiritually powerful. Its soothing aroma calms the conscious mind before any self care rituals, and promotes higher levels of consciousness, helping with personal growth, spiritual inspiration and manifesting peace. Mama Moon is a magical woman who uses scent magic to activate special powers and influence our moods. A must for anyone who likes to harness the energy and rhythmicity of the moon. 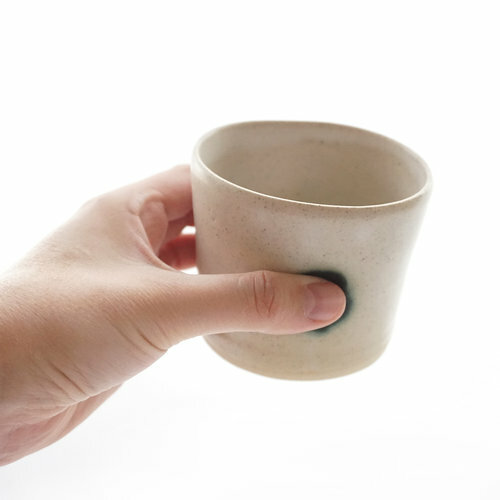 This handmade stoneware cup is a great addition to your Christmas day rituals and perfect size for your coffee (or mulled wine! ), with its thumb indents for ultimate comfort. Wheel-thrown or handmade by ceramicist Emma Voller in London, her ceramics are made with a focus on functional forms and aim to bring a little bit of fun and beauty to every day uses. 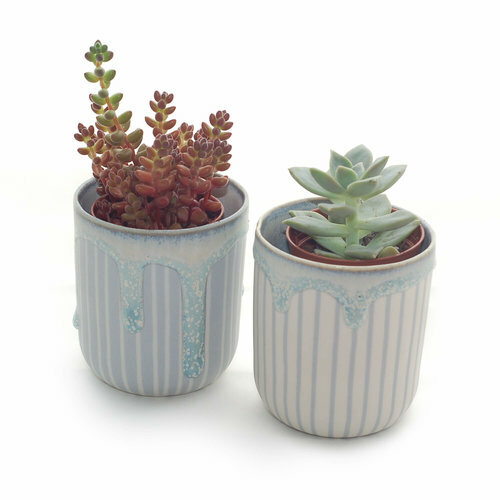 This handmade porcelain pot is perfect for small succulents and cacti, Duck Ceramic’s trademark drippy striped design complement any space. Duck Ceramics is an independent pottery studio run by Alice Duck. Originally founded in a small attic room in her Bristol flat, Alice now makes and finishes each piece by hand in her Brighton studio. No two pieces are the same and Alice relishes in the unexpected outcomes of each piece, ensuring each hand-crafted item has its own character and charm. For that friend that loves sprucing up their place, or a newly moved buddy has empty walls in need of some love. 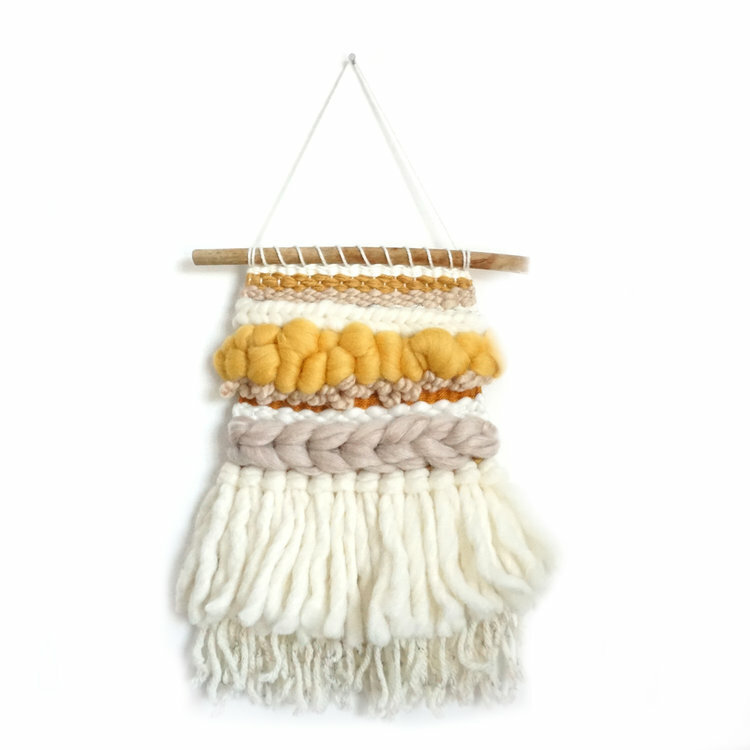 These textural wall hangings are a really thoughtful gift. Weavings last lifetime and help make a feature out of any wall. Who else gets super dry skin during these colder months? This softening, strengthening facial oil will give you that much needed moisture boost, whatever your gender! It also leaves you smelling like a summer fresh lawn in a citrus orchard. Packed with Vitamin C and antioxidants, this natural facial oil will help to repair your skin after one too many Christmas parties. I mean, just look at them! So snazzy. Koolaahs are a traditional handwoven, generations-old craft from the Northern Indian Himalayas and each pair is completely unique. They are crafted by women in remote Indian villages in beautiful vivid colours and are easy to slip on and off, for slow days in front of the fire. For that friend who loves burning incense and making their home feel like a sensory palace, this gorgeous dish is a joy to unwrap. Why not treat them to some palo santo incense sticks from Incausa to compliment the dish. Every dish is hand thrown in London, each one is unique and has it's own signature charm and spirit. Iris is a full colour 78 card oracle deck, full of vibrant and compelling illustrations. I have been a huge fan of Mary Elizabeth Evans and her traditional folk art style for a long time, and this beautiful deck adds that something extra to your divinatory and healing practices. Now, I know deodorant isn’t the sexiest of gifts but this is some seriously revolutionary stuff! This natural balm is consciously made with shea butter, coconut oil, lemongrass and peppermint and leaves your underarms feeling mighty fresh for up to 24 hrs. There’s no nasties in it, it smells great, and the little jar is handy for re-using afterwards. Time for a new deodorant for 2019? The five statement rings in this collection, created in a special partnership between Sharla of Sharlala Jewellery and I, each have their own distinctive symbol and secret meaning. Each unique ring is a precious, wearable talisman bearing a message of Truth, Trust, Light, Honour or Wisdom. Which one will you give to that special person to behold and treasure?